Become an All Access member to view all the tutorials in including Photos for Mac & Luminar! In this free lesson from the full tutorial on Safari for Mac see how to use the sidebar. With the sidebar you can view, organize and edit bookmarks, your reading list and shared links! Trackpad Gestures & Full Screen Tabs in Mail. 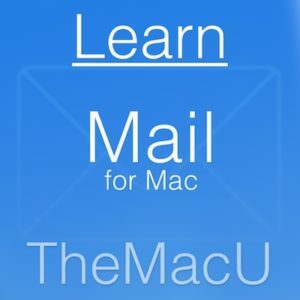 In this lesson from the full tutorial on Mail for Mac see how to use trackpad gestures to quickly manage your emails and learn how you can use Mail in Full Screen all the time with Full Screen Tabs. https://s3.amazonaws.com/tmucoursevideos/wp-content/uploads/2017/05/10225605/Mail-2x.jpg 400 400 Drew https://themacu.com/wp-content/uploads/2017/06/TMU.com-Header-logo-jpg-300x138.jpg Drew2017-05-17 16:51:232019-03-18 16:46:13Trackpad Gestures & Full Screen Tabs in Mail. Customize Icons on your Mac! In this free lesson from TheMacU.com see how to quickly replace the icon for an App, Folder, Drive or File! https://themacu.com/wp-content/uploads/2017/05/Podcast-graphic-copy.jpg 1500 1500 Drew https://themacu.com/wp-content/uploads/2017/06/TMU.com-Header-logo-jpg-300x138.jpg Drew2017-05-12 10:57:202018-04-24 15:40:25Customize Icons on your Mac! Use Disk Utility to Erase or Reformat a Disk. In this lesson see how to use your Mac’s Disk Utility App to erase or reformat a disk or drive. Learn much more about Mac Utilities in the full tutorial! https://themacu.com/wp-content/uploads/2017/05/Utilities-logo-PNG.png 1024 1024 Drew https://themacu.com/wp-content/uploads/2017/06/TMU.com-Header-logo-jpg-300x138.jpg Drew2017-03-19 21:25:462018-06-29 10:47:16Use Disk Utility to Erase or Reformat a Disk. In this lesson from our full tutorial for Sparkle for Mac we look at the fantastic import page feature added in Sparkle 2.1. To learn more about Sparkle become an All Access member and view the full tutorial. Using the MacBook Pro Touch Bar with the Maps App! In this lesson from the Maps tutorial within our Mini Tutorials Collection see how to use the Touch Bar for quick access to different tools in Maps. Learn much more in the full Maps tutorial! https://s3.amazonaws.com/tmucoursevideos/wp-content/uploads/2017/05/12171934/Mini-Tutorials-PNG-squashed.png 1024 1024 Drew https://themacu.com/wp-content/uploads/2017/06/TMU.com-Header-logo-jpg-300x138.jpg Drew2017-02-20 10:40:312018-06-29 11:04:22Using the MacBook Pro Touch Bar with the Maps App! Mac Tutorial: Use the Grab App to take timed Screen Captures! In this quick lesson see how to take timed captures of your display or Touch Bar with the Grab App. To learn much more about how to use your Mac, iPad & iPhone join TheMacU All Access. Start your Free Trial here! https://themacu.com/wp-content/uploads/2017/05/Podcast-graphic-copy.jpg 1500 1500 Drew https://themacu.com/wp-content/uploads/2017/06/TMU.com-Header-logo-jpg-300x138.jpg Drew2017-02-04 10:08:222018-06-29 11:56:55Mac Tutorial: Use the Grab App to take timed Screen Captures! Use Quicktime Player to record the display of your Mac. In this free Quick lesson from TheMacU.com see how to use the often overlooked Quicktime Player to record whats happening on the display of your Mac. Get instant access to all of TheMacU Tutorials for Mac, iPad & iPhone by becoming an All Access Member. Get Started with a Free Trial! https://themacu.com/wp-content/uploads/2017/05/Podcast-graphic-copy.jpg 1500 1500 Drew https://themacu.com/wp-content/uploads/2017/06/TMU.com-Header-logo-jpg-300x138.jpg Drew2017-01-21 10:13:052018-06-29 12:02:04Use Quicktime Player to record the display of your Mac. Luminar Tutorial: Use Luminar as an Extension in Photos for Mac! In this lesson from our full tutorial on Luminar from MacPhun see how to install and use Luminar as an extension in the Photos App for Mac! https://themacu.com/wp-content/uploads/2017/05/Luminar-logo-jpg.jpg 1024 1024 Drew https://themacu.com/wp-content/uploads/2017/06/TMU.com-Header-logo-jpg-300x138.jpg Drew2017-01-14 12:16:242018-06-29 12:06:07Luminar Tutorial: Use Luminar as an Extension in Photos for Mac!